for your $2,566,685 raised to help support the neediest of our neighbors! 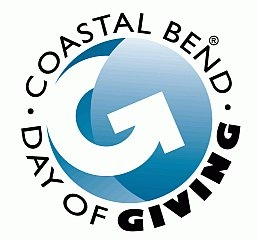 Coastal Bend Day of Giving returns in 2019 on November 12! Join us for 24 hours of giving to benefit our local nonprofits and make a difference. Coastal Bend Day of Giving brings the region together as one community, raising money and awareness for our local nonprofits during the 24-hour online giving challenge. We inspire people to give generously to nonprofits making our region stronger, creating a thriving community for all. Coastal Bend Day of Giving is a 24 hour online opportunity to raise funds for nonprofits at the forefront of assisting the neediest of our neighbors. This community give-together begins at midnight on November 12 with a minimum gift of only $10. Each of the participating nonprofits is eligible for a matching gift, enabling them to at least double their match on that Day! So gather your circles, schedule your gifts, and get ready to cheer for your favorite nonprofits throughout the day.